What if spiders could fly, or at least, levitate? What would the ecosystem be like? Would society be any different? What if they suddenly gained the ability to fly? The origin of their new flight ability? Not sure. Wings? Engines? Magic? Re: What if Spiders could fly? Some spiders already can fly, kind of, by sailing on the wind with their webs. If they were able to control their flight well enough to prey on other insects directly? There are already plenty of bugs that do that. We'd just have one more bug competing with dragonflies and the like. If spiders were better at it, the dragonfly population drops. If they're not, they go back to their niche making webs and eating bugs the old fashioned way. As for our society, I reckon our opinions on spiders would be even more intense. Fear, admiration, and religious-experiences-when-you-see-a-spider-float-by-with-magic. SDK wrote: Some spiders already can fly, kind of, by sailing on the wind with their webs. If they were able to control their flight well enough to prey on other insects directly? There are already plenty of bugs that do that. We'd just have one more bug competing with dragonflies and the like. If spiders were better at it, the dragonfly population drops. If they're not, they go back to their niche making webs and eating bugs the old fashioned way. a while ago and was thinking about it. I think that spiders would be more terrifying, and could be more deadly. There are social spiders that cooperate with each other to bring down prey larger than themselves. Imagine flying social spiders dropping nets on people: Terrifying. Would flying spiders really be much different from moths? I feel there is something of a gulf between "spiders that fly" and "spiders large enough to eat humans who fly in flocks and spin freestanding nets in which to capture large mammalian prey", but perhaps I lack imagination. Copper Bezel wrote: but perhaps I lack imagination. So this is how the world ends. Not with a bang, but with hordes of giant, flying, homophagic spiders. With nets. Well, it's a metaphorical bang, at least. Copper Bezel wrote: I feel there is something of a gulf between "spiders that fly" and "spiders large enough to eat humans who fly in flocks and spin freestanding nets in which to capture large mammalian prey", but perhaps I lack imagination. They would evolve, slowly but surely. There are spiders that work together to make large webs to capture things much larger than themselves. I'm sure they would figure out something. Many insects can spin silk, and many of those fly at some point in their life cycle, yet they frequently lose this ability after maturing. If it was truly advantageous to spin nets with which to capture prey, some bug would have done it. The world WOULD end, if spiders could fly. Not because they could potentially band together and catch us in giant spiderweb nets. But because so many people are afraid of spiders. Just seeing one, even a tiny one, puts many people in panic mode. 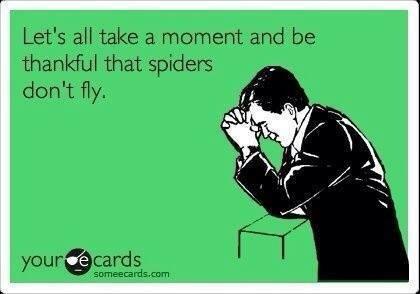 Those people would be even more afraid of flying spiders. After all, now they could fly in an open window, or fly onto your face. Or they could, as mentioned, catch you in a giant net. All things that those people would be thinking. This thinking will in turn cause the people in question to have massive panic attacks. People in all kinds of jobs, also important ones. Air traffic controllers, people in governments, car mechanics. As a result, society will break down because enough people won't be able to do their jobs, and there won't be enough left to do them. And when society has broken down, that is when the spiders will attack us, spindle us into a giant web, and have a feast like never before. Life, uh, finds a way? The Goldblum Axiom, bringing the Theory of Evolution to the Everyman since 1993.